Toward the end of last night's Super Tuesday rally in Essex, Sen. Bernie Sanders (I-Vt.) joined pianist Ben Folds and a crew of local musicians onstage to perform "This Land Is Your Land," a signature song of his campaign — at least in Vermont. We've definitively established that Bernie's not much of a singer, but he had plenty of help. Although he wasn't on mic, we did get to witness some of the man's legendary rhythm. 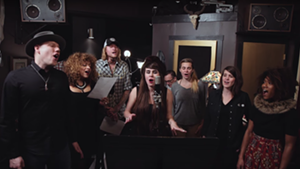 You'll recognize several of the singers from a video some of his very talented constituents released in January. 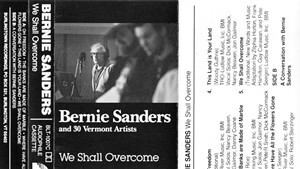 Vermont musicians Dwight Richter, Nicole Nelson, Kat Wright and Brett Hughes belted the gospel-inspired, acoustic arrangement, joined by Sanders staffer Paul Stovall (who earlier performed the national anthem) and Folds on piano. Wife Jane O'Meara Sanders, son Levi Sanders and a collection of grandchildren also joined the candidate onstage.